I wouldn’t consider myself a product junkie because although I like to try new products; Regardless of how much I like the product, I will try to use it up before I get a new one. That’s just how I am. Unless it’s like an EPIC FAIL and it’s just doing no justice whatsoever. I love this stuff. If you’re the type of person that doesn’t like different types of weird ingredients that we hardly can pronounce or dyes, then you might not like this one. Right now I don’t really mind it. It makes me hair so manageable & soft. It’s a great moisturizer. My sister actually recommended it to me. I’m completely out. I would repurchase if I wasn’t on a hunt for something new. Ok guys, you know I’ve already talked about my love|hate relationship with this product. Initially it was making my hair feel dry. Even though it’s a jar of the best ingredients. Nevertheless, I was determined to find an alternative. I feel that it works best with other products, such as olive oil or conditioner. I simply can’t use this alone. Which is why I wouldn’t repurchase. I don’t like going through the hassle of tweeking to my liking. I bought this from Wal Mart a while back, before I had any intentions of going natural, because I wanted something to cater to my split ends. I’m not pretty sure if it works that much. I haven’t seen a huge difference with my ends. I recently trimmed them. I more so like it for a Co Washing and it’s been doing the job. It’s also what I use before I shampoo my hair to detangle my hair! It works like a charm. I don’t think I would repurchase because I plan on trying out a cheaper conditioner like VO5 for co washing, because I believe this was on the pricey side, but other than that it’s great! This is going on my second bottle of Suave’s shampoo and conditioners. Before this I had Black Raspberry & White Tea. Anyways…. I love suave first because it’s so inexpensive! & It gets the job done. I’m not going to pay an arm and a leg for something that is going to be washed down the drain. I find that this particular one gets my hair SUPER DUPER clean, to the point where it almost strips my hair, which I don’t really like. It could be the aloe that’s in it. I have to use a lot of conditioner just to get my hair to feel the way I like. Once this bottle is done I don’t think I’ll go back to it. I love suave in general just not this particular one too much. Now this is a staple product of mine. I HAVE to have it. Lol! Since I stopped using grease on my scalp this is what I’ve been using to oil my scalp and to seal moisture in my hair. It has never lead me the wrong way. It gives me a healthy shine & makes it more manageable. Sometimes I add just a few drops of this to my Olive Oil. I wouldn’t recommend using essential oils on their own, simply because they’re so potent. It’s great if you have an itchy scalp and you just want to soothe it. I’ve read that it simulates hair follicles which promotes growth & health! It also gives a nice cooling sensation. Now I’ve heard a lot of positive things about this product. My cousin loves it so she got it for me. I figured I’d give it a try. I must warn you it is very thick. That can be a bit of a turn off to some. So I add it to my olive oil so it’s not as….dense. So far I like it. My scalp hasn’t been itchy and it doesn’t get a dry as fast. A little goes a long way. There’s no need to have a heavy hand with this. There’s no way I could forget about this. Whether you’re drinking it or using it on your hair, water is a MUST. It’s not only beneficial for your hair, but your overall health! If we keep our body hydrated on the inside, it will reflect on the outside. Today I’m coming to you with a new series that I’ve been working on for a while. These are the SOON-TO-BE-CURLY GIRL COMMANDMENTS. These are simply things that are imperative for transitioning growth. Commandment #1–Thou shalt spend time on thy mane! As a full time assistant teacher/student, I am fully aware of the importance of time management. It’s a serious issue for me, and I try my best to manage my time well. As soon to be naturals, it is extremely important that we spend time on our hair. Why? Not only do we have to take care of one texture, we have to maintain two! So we have to find a happy medium of products that work for the new growth as well as the relaxed ends. Think about it in terms of an end of year research paper. If you got assigned this paper in September, and are just starting it the night before it’s due, chances are you’re not getting a good grade. It’s the same with hair. You need to put time in it to see the results you want. Yes, you will have trial and errors, and may even waste some money, but that’s all apart of the process. Spending time on your hair will grant you the results you are looking for. Moisture? Length retention? If you spend time on your hair, you will achieve it! Face it, ladies, do we really want to have our hair looking like the Sahara Desert? Dull and dry? Or do we want it to look like the long, shiny, moisturizer crowns that we are capable of having? Every week someone never fails to ask how I achieve my curls. The answer is always flexi rods. They’ve been my go to styler since the very beginning. It’s perfect for transitioners, especially if you’re really trying to disguise the 2 textures. Here’s what I do. I like to apply the flexi rods on semi damp hair. If my hair is dripping wet it will take forever to dry. Then I smooth some type of moisturizer from root to tip, making sure they’re are no tangles. I have been gravitating towards my Curl Enhancing Smoothie by Shea Moisture that I wasn’t a complete fan of. But I just want to use it up. Would I got back and repurchase? Ehhh I don’t think so. After that I seal in the moisture with a mix of Jamaican Black Castor Oil & Olive Oil. & Lastly I apply the flexi rods! It can be a little time consuming & annoying to sleep in, but the results are worth it. The curls normally last me a couple days. You also have the option of styling however you want. Mohawk, Side bun, Low bun, or a even a full out curly fro! ~ If I’m not going for that Shirley Temple look I roll the flexi rod from the very ends of my hair upwards. (If that makes any sense) I think I helps the curl hang more. Rather then rolling the hair all in the center of the rod. It’s Back To Olive Oil for Moi! I know I said I’d tell you what happened with the Argan Oil incident in my last post, and I’m trying not to go back on my word. So, let’s chat. Remember this post? When I rambled on and on about my new found love affair with Argan Oil? Well, I take that back. Want to know why? Two words. PRODUCT BUILDUP. I DESPISE product buildup with a passion. I hate it because I look like I’m crazy and dirty scratching my head all day. When applying the Argan Oil on my hair that Saturday, it felt lovely. It was the only product I used, but it felt SUPER smoothing and conditioning to my hair. But by Thursday, my scalp was itching so badly! I don’t know what it was. I was talking to Irene about it, and she suggested that maybe I put on too much. That might have been it, as I did apply liberally and it’s a thick oil. However, will I use it again? Probably not. I might revisit it sometime in the future, but as for right now, I think I’m good. Have you had any bad experiences with Argan Oil? Are there any hair products that I should stay away from? By the way, DivinelyRooted is going to be featured on Kendra’s blog soon! For any of you who are readers, you know that Kendra’s my girl! Hello, beautiful people I hope you’re having a good week! I’m coming to you today with Sunday Inspiration #3. But first, allow me to give some background. When I first started to transition, braid outs were my GO TO STYLE. In those summer months, I would be braiding up my tresses, sleeping on them, getting up, taking them out, and I’d be on my way! Somewhere along the line though, I stopped. I think it was a combination of having to braid my hair every night and some other stuff. BUT, for this Sunday Inspiration, I decided to revisit my old friend. Before getting into the juicy stuff, here’s my inspiration. This week, it was Kendra of Natural with Kendra, who is QUEEN of the beehive(in my humble opinion.) This style came from one of her latest blog posts, which you can find here. Ugh, I love her hair. It’s so big and thick! For more pictures, open up that link. So, here’s my take, and then we’ll do the prep and breakdown, okay? I had to take selfies that day, sorry! So, a horrible experience with Argan Oil(more on that later this week– maybe), I washed my hair on Friday night instead of my regular Saturday. After washing, I used a regular conditioner to comb through, and then applied my deep condish. (I detangled BEFOREHAND this time!) 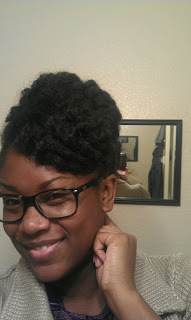 After that, I twisted my hair into about 6 big twists, and went to bed, thinking I would rock a twist out on Sunday. Here’s a little something: I am VERY indecisive, and I can switch my mind easily. The twistout didn’t look half bad! I actually had a lot of definition, and I was pleased! …But then I changed my mind. So then, I proceeded to comb out my hair, braid it up, and install flexi rods. I woke up the next morning, took down my braids with olive oil, and VOILA! I had VA-VA-VOOM volume, definition, and curls. I made a large flat twist in the back of head, and then brought all of my hair to the front of my head. I gave it some height, pinned it back, and added a headband. And that was it. It didn’t take too much time, and it’s definitely a style that I’ll revisit. The one thing I would change is the amount of volume. Next time, I think I’ll make a part from ear to ear, and raise the top half of my hair in the beehive, instead of clumping it all up there. Hope you enjoyed! Look out for more posts soon!